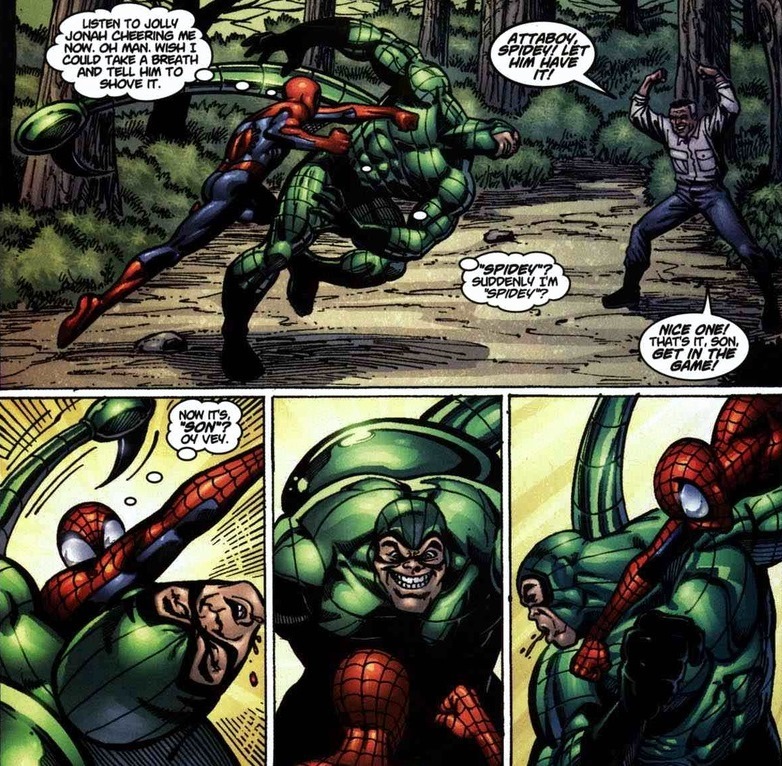 With all the emotionally draining, soul-crushing Spider-Man stories of the past decade or so, sometimes it’s nice to read a story that reminds us why we read Spider-Man in the first place: he’s goofy. 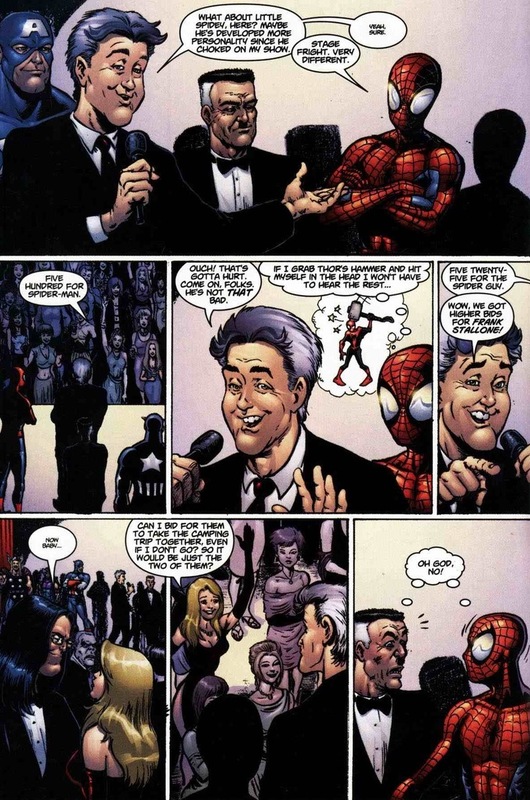 So when I read a fun one-shot from 2002 titled Spider-Man: Sweet Charity, written by Ron Zimmerman and drawn by Darick Robertson, I knew I had to share it with you all. 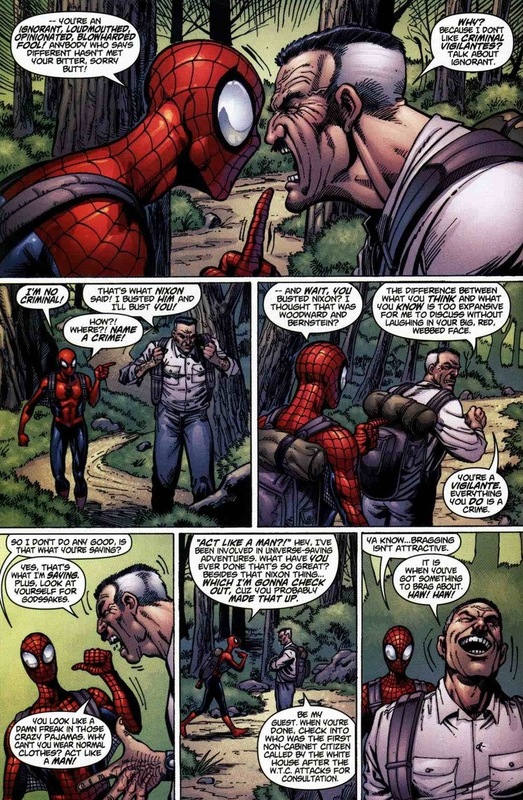 Because Spider-Man and J. Jonah Jameson go camping. Jameson has an idea! To raise money for charity, he’ll have a superstar celebrity auction! Y’see, any bad guy can punch his archenemy. Any bad guy can jump kick or throw a car or shoot plasma rays at his archenemy. But it takes a true genius to punish his archenemy with the emotional and mental blast of forcing Spider-Man to spend a weekend with the man he hates the most. That probably includes Green Goblin, who killed Spider-Man’s girlfriend. And the best part? This spear in Spider-Man’s heart serves entirely to help starving orphans or other charitable causes. 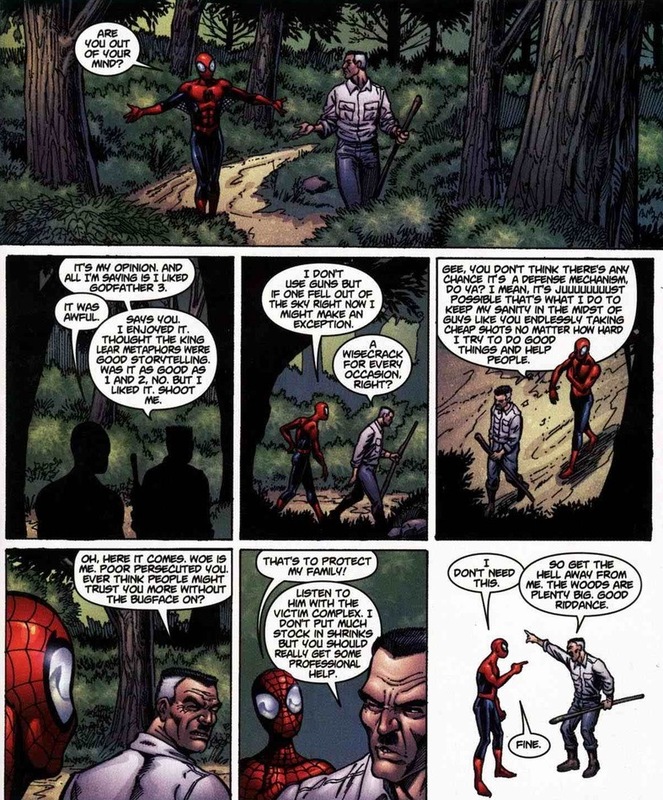 Most of the issue goes as you expect: long walks in the woods with lots of bickering. You know how most of Spider-Man’s rogue gallery is made of baddies in animal costumes (Vulture, Rhino, Black Cat, Chameleon, Lizard, etc.)? Well, sometimes these dudes like to hang out in their natural habitat. For the depth and complexity of the plot, you should buy the actual issue. Because I just want to show you the most important, most significant pages of this wonderful comic. The pages that make your heart jump and your spirit soar. Like Scorpion fighting wolves while discussing Popeye. 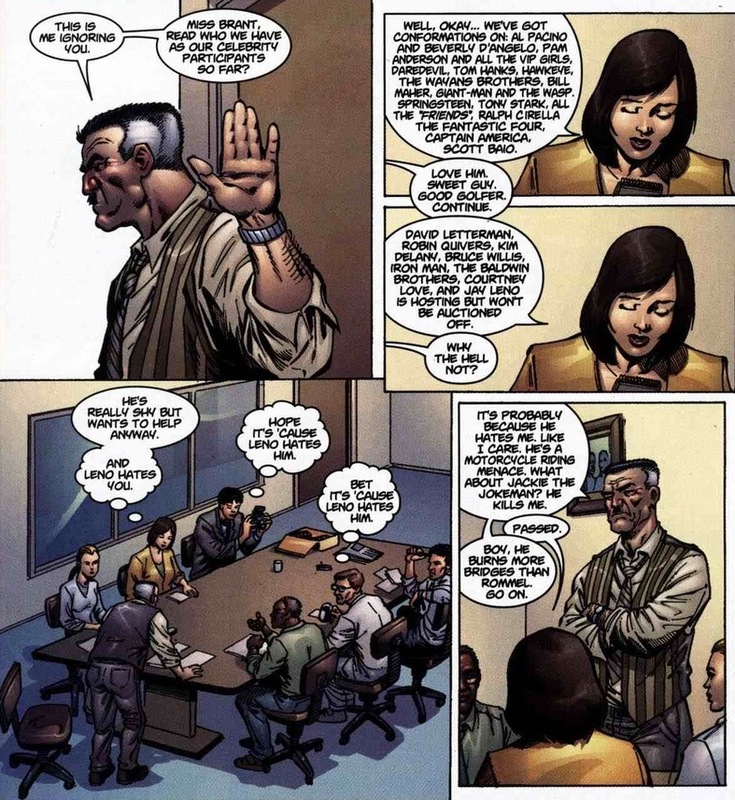 I really wasn’t lying when I mentioned most of the issue involves Spider-Man and Jameson arguing. Apparently a decade and a half of bad blood mixed with an outdoor hike doesn’t lead to hugs, kisses, and apologies. On a related note, I’m glad they changed Jameson’s mustache to a long bushy one in the past couple years. Writers love the whole, “Can you trust a hero who wear a mask?” discussion. And for good reason. It’s too much philosophy for me, and considering every Avenger except Luke Cage hides his or her identity, we can just assume characters bring that argument up so we know they don’t trust the good guys. Plus, Luke Cage’s superhero costume is a t-shirt and jeans. We should check back in with Scorpion. Eventually, the supervillain meets our two protagonists because the story would be awful if he didn’t. Zimmerman writes a convincing argument about how dangerous Scorpion actually can be when he tries. I mean, not against Thor or anything, but Spider-Man has to be careful. 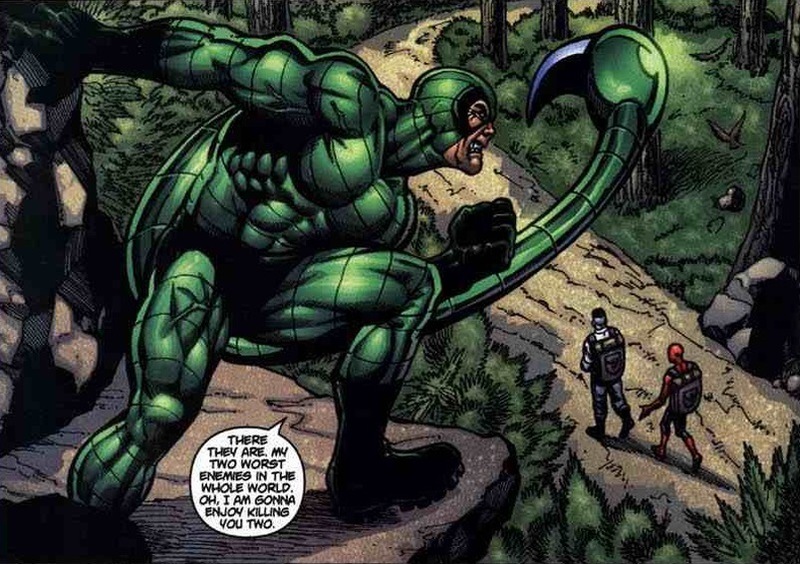 Luckily, if a Spider-Man villain isn’t a super genius, he’s a moron. Like Scorpion. 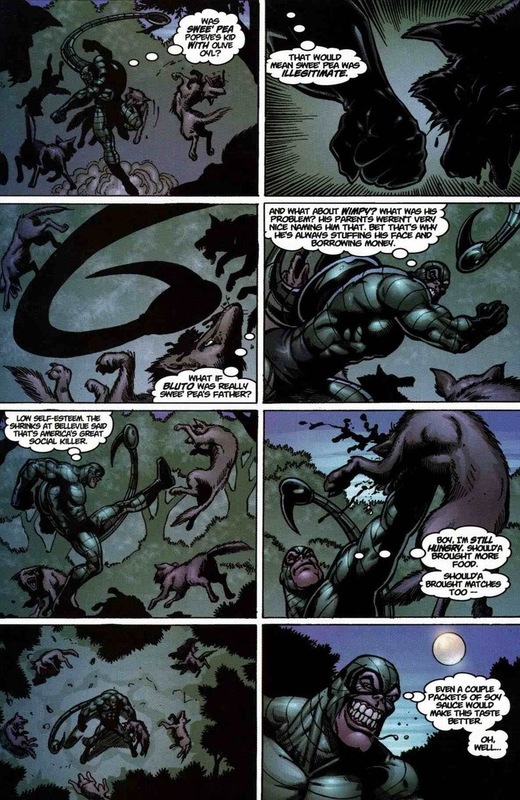 Supervillains tend to land on IQ extremes. I include the next page only for a single line that’ll delight me forever. 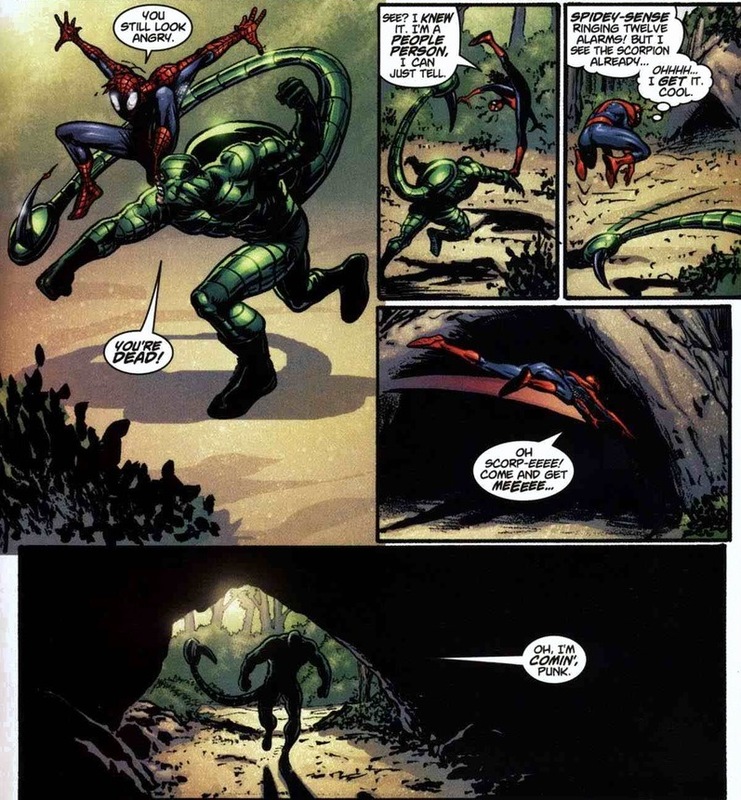 The single page that sums up Jameson’s complete lack of respect for our web-slinging hero. 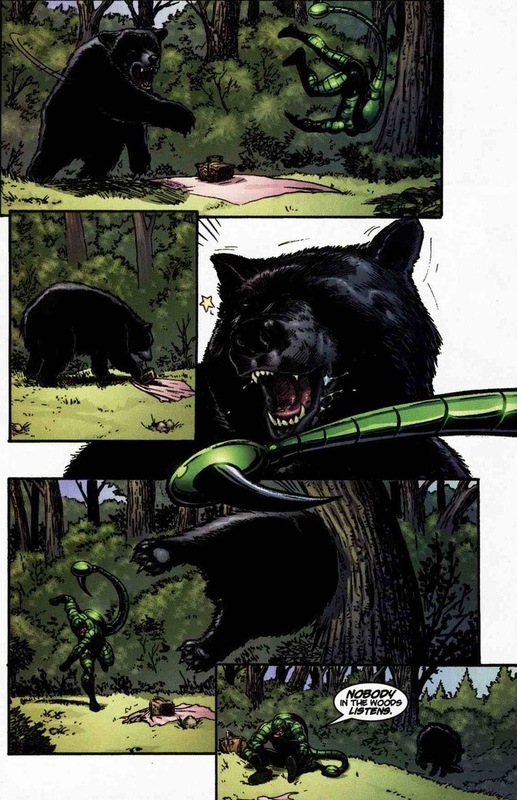 That’s right, Spider-Man makes woodland creatures do the dirty work for him. Those bears did all the real fighting. 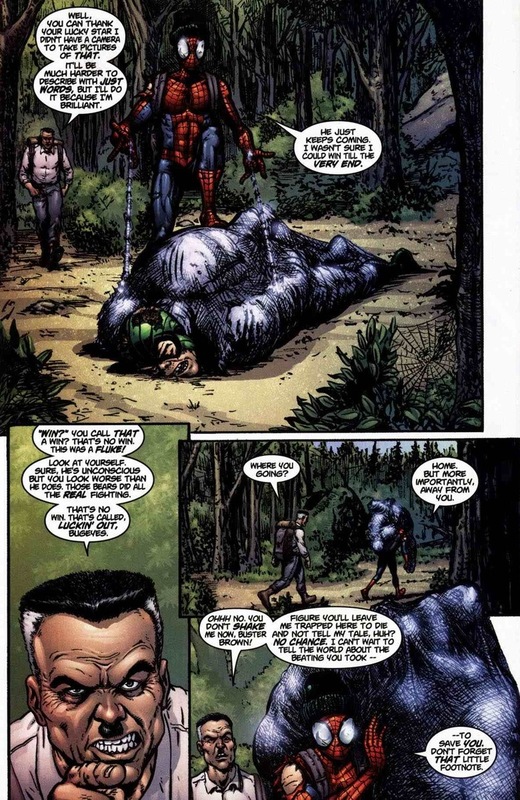 Instead of praising Spider-Man for leading Scorpion into a brilliant trap (instead of the 50/50 chance of victory in the fistfight beforehand), Jameson berates him with one of the greatest put-downs in Spider-Man/Jameson camping story arcs. Still, though the trip’s a bust, it could have been worse. The Vision would totally be the worst golf partner. As much fun as JJJ is as a heel, and we all know what a great villain he is, Marvel did one story a bunch of years ago that stood him as a great man. No, really, and not Ultimate JJJ or a Chameleon disguised as him. It was a big story with the X-Men, when Bastion was new and no one knew he was Nimrod yet. He killed a reporter who was digging into his government operation, and then went to bribe JJJ in his own office. Spider-Man was across town dealing with Marrow and some fist fighting joke telling stuff. JJJ on his own stood his ground and faced down a real menace, and even if he didn’t know he was a terrible time traveling robot from the future hybrid abomination thing, the newspaper man still knew he was a shady as Hell X-Files type government spook who could make people vanish. If I could remember the issue or the name of the story line I would say look it up.